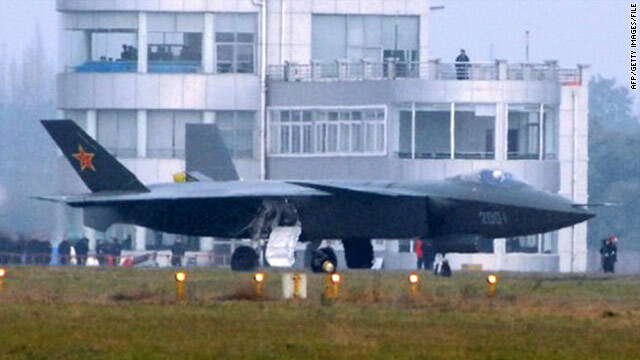 China's J-20 stealth fighter appears on a runway in Chengdu in January. China has had a second test flight of its J-20 stealth fighter jet, according to a report from the government-owned newspaper Global Times. Under the headline "Mystery jet 'flies' again," the paper cited witness accounts that the jet flew Sunday in Chengdu as part of celebrations of the 60th anniversary of China's aviation industry. The flight lasted almost an hour and a half, an unnamed witness told Global Times. "The J-20 made several passes and waggled its wings (rolling the plane first to one side then to the other) to salute the crowd near the airfield," Global Times quotes the witness as saying. The J-20 "has been touted as a potential challenger to the U.S. Air Force's F-22 Raptor, the world's only fifth-generation fighter jet," Global Times said. The J-20 made its first flight in January as U.S. Defense Secretary Robert Gates was visiting China. "plowshears" rather. Like I'm a schoolmarm. HAHA!!!! The Chinese have a jet built by..........the Chinese. What could be funnier? Am I the only one that sees the humor in this? That's right. Declare all the 'peace and security' you want. As President Obama knows...ther can be no true peace until there is peace between man and God. That's right. The President of the United States of America is a God fearing man No, not as in 'afraid' of God. President Obama, an devout Christian, has an wholesome fear of displeasing his heavenly father. If you don't believe me...just askk him! You'd be surprised at how many Americans try to communicate with the "prez". It's quite funny just how these right-wing fanatics try to scare us about China. They've been using Ussama bin Laden for years on end after 9/11 but now they're afraid that it may come to light the fact that he's most probably dead now and so they need China for that purpose to drum up support for all this unnecessary military spending!!! I have seen good quality of a certain product improves in a period of time to become top quality. The chinese products are improving, they are every where arround the world. More countries like third world countries arround the world are getting supplies from china because they are cheap and can afford where as the US is expensive and also the money china gets from sales of its product its not spending on killing civilains like Iraq Afganistan and now tripolly so why buying good qualities from the US when the whole world now know where the US spends it money from selling its good quality products like the stealt fighter. Let me guess. It looks just like ours! LOL!! The plane looks similar because of the aerodynamic calculations being used, you guys. Their engine is not quite that good but just wait they will get another one better, stolen or not, then it will be a contender at the Paris air shows. As for plans to go to war with USA what are you people thinking? Even for the best USA planes it is still a long flight from China to US...And it is the same distance the other way around 🙂 China does not need anything from US other than recognition as somebody "Equal" And "China" is not everybody in that country but just the select few in the government. Do people realize that there are millions of Chinese living in mud huts and eating a handful of gruel a day, if, they are lucky ? Waging war requires resources, (oil) and they do not have that. As for food, that is lacking also. Launching men in space does not resolve much other than ego boosting for a few. The people in the mud huts only care if they have something to eat tomorrow because today and yesterday they most likely did not. China is far to the U.S? Hey man , heard about South China Sea, or West China Sea where islets and sea water there are disputed by China and 5 Asian countries? One of them is the Philippines that has mutual defense pact with the U.S, in case war erupt in that theather, expect J-20s and F-20s would see action there. The product of Chinese espionage, not home grown abilities. Oh No! The Chinese have a plane that they claim can match the U.S. F-22! This has never happened before in history.... except when the Soviet Union made the MIG 29 which was actually better than the F-15... and when the Soviet Union build the MIG 21 which went toe-to toe with the best american fighters in Vietnam, and when Nazi Germany built the ME 262 and the Komet..... Anyway, we still have submarines that nobody has ever been able to find, and they can be loaded with 24 Trident II missiles that can carry 8 warheads in each missile... so China better be feeling lucky if they want to start something.